19/01 20/01 PROMOGEST SRL IMOLA RALLY EVENT RALLY IN CIRCUITO BO NAZ - NT naz. 26/01 26/01 SAN MARTINO CORSE 15Â° SNOWTROPHY PRIMIERO SAN MARTINO DI CASTROZZA REG. STORICHE TURISTICA / REG. MODERNE TURISTICA TN 2^ NT - NT naz. 26/01 26/01 SAN MARTINO CORSE 15Â° SNOWTROPHY PRIMIERO SAN MARTINO DI CASTROZZA REG. MODERNE TURISTICA / REG. STORICHE TURISTICA TN 2^ NT - NT naz. 26/01 27/01 OR AC LIVORNO 2Â° RALLYE COPPA LIBURNA ASFALTO RALLY DUE LI 6^ naz. 27/01 27/01 Racing Kart 1^ COPPA CITTÃ€ DI CASALUCE NAZIONALE E PRODRIVER CE 4^ naz. 31/01 03/02 Wsk Promotion S.R.L. 1^PROVA WSK MASTER SERIES NAZIONALE LE 4^ INT NT - NT internaz. 02/02 02/02 SPORT RALLY TEAM A.S.D. 1A AUTOSCIATORIA DELLE VALLI DEL LANZO RADUNI TO naz. 02/02 03/02 Scuderia Balestrero Lucca Srl 4Â° RONDE DELLA VAL D'ORCIA RONDE SI 6^ naz. 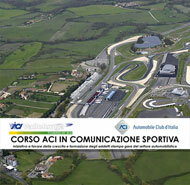 02/02 03/02 OR SO GE SA SRL VARANO RALLY EXPERIENCE VELOCITA' IN CIRCUITO PR NAZ - NT naz. 08/02 09/02 OR RALLY CLUB 70 30A COPPA DALLA FAVERA REG. STORICHE CLASSICA PD 2^ NT naz. 10/02 10/02 K.C. Dei Trulli COPPA CSAI DI ZONA 4 (ROTAX) NAZIONALE E PRODRIVER TA 4^ CO ZONE naz.